Commissioned by clothing manufacturer William R. Johnston, and built in 1875 by prominent local architectural firm, Langley, Langley & Burke, 571 Jarvis is a significant visual reminder of the affluence and grandeur of Jarvis street during the late 19th and early 20th centuries. Both the exterior and interior are designated by the City of Toronto under Part IV of the Ontario Heritage Act. The interior is characterized by remarkably well-preserved and striking detail, including original fireplaces, elaborate ceiling plasterwork, leaded glass windows, and encaustic tile floors. The property has been redeveloped for Casey House as a state-of-the-art AIDS/HIV healthcare facility that integrates the historic building with a new four-storey extension designed by Hariri Pontarini. 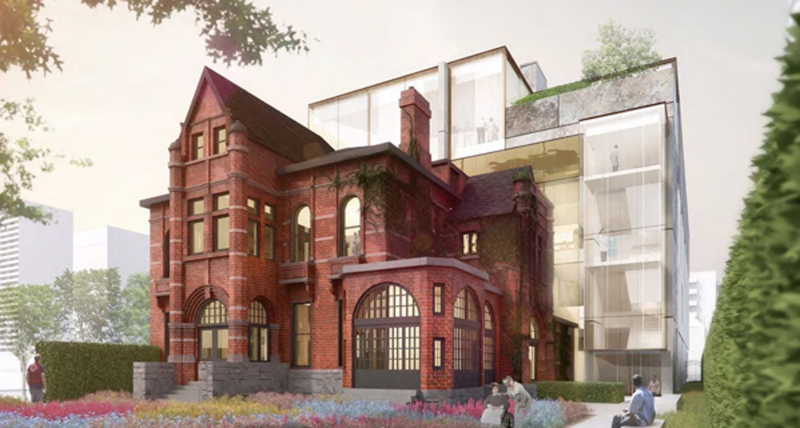 ERA prepared a Master Plan for the property and oversaw rehabilitation of all exterior and interior heritage fabric, including the masonry envelope, woodwork, windows, doors, roof, and intricate wood and plasterwork, replacing deteriorated elements where necessary. The exterior scope of services included the repointing of brickwork, the replacement of stone bands, the fabrication and installation of new window boxes, the repair and repainting of the iron fence, colour washing of the small sunroom addition, new lead-coated copper spiralettes and the demolition of 119 Isabella Street, to allow for construction of the hospital addition. The interior scope involved: the complete repair and repainting of the plasterwork (including the development of the colour scheme), the repair/refinishing of the wood work as a component of the timber flooring on the main level and staircase, the mosaic flooring in the vestibule and the preservation/relocation of the fireplaces. Perkins Eastman Black Architects Inc.